I'm quite a fan of the Zoella Beauty range and although I don't own everything she's brought out in the last three collections I have picked up bits and pieces from each one. The Sweet Inspirations collection is her newest and I picked up two products - The bath latte being one of them. Lets first of all lets start with the packaging. How gorgeous?! I love the retro inspired print, the pastel colours and how Zoe went with milk bottle type packaging for this particular product. 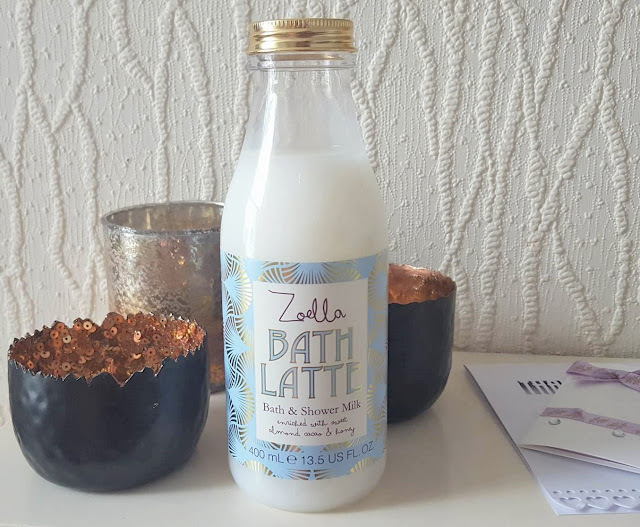 The bath latte is a bath and shower milk. You basically run it under running water or apply to the skin when in the shower. This smells incredible. It's definitely sweet, but not the sickly type of sweet - simply, amazing sweet. It's made with sweet almond, cacao and honey. The scent really fills the room when poured in the bath and leaves your skin feeling amazing and so, so soft and smooth. It's not badly priced at £6 either and a little really does go a long way. You can buy the Sweet Inspirations collection at Superdrug and Feelunique now.